The submersible agitators „Turbomix“ are particularly suitable for the homogenization of liquid manure, sewage sludge and biogas substrates. 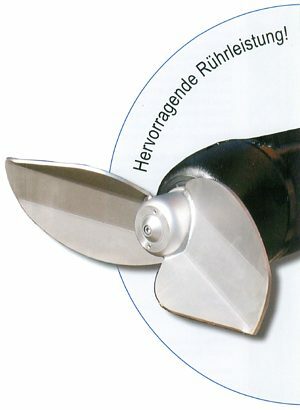 The usage of stainless steel propellers with a high blade strength and face seals guarantees a long product life. Thermal sensors built into the motor’s winding protect from overheating. Homogeneous manure is the basis for exact manure dispersion and an optimum fertilization effect. The device runs quietly and can be used unattended. As the agitator is operating immersed in liquid, it causes less emission while stirring. 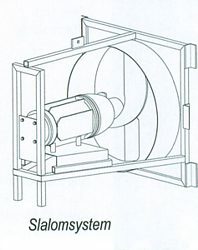 By using the installation variants as shown below, the Turbomix can be adjusted to the filling level in silos, receiving pits or fermenters. 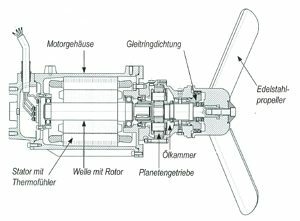 As well the flow direction of the propeller can be set for optimum performance. 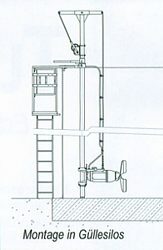 Used in a biogas plant, the agitators stand out due to best possible adjustment possibilities and a low power requirement. Optimum use of the digester is feasible because dead zones and sediments are avoided. Due to reduced flow turbulences and the use of planetary gearing, the Turbomix agitators are highly energy-efficient. Depending on the electricity rate, a fairly low consumption can be achieved. 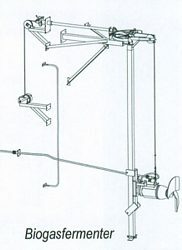 "Turbomix" with 8 m electric cable, installation kit for head tank with work platform; biogas fermenting containers or receiving cesspits available. Accessories are compiled according to the installation conditions and to your requirements. A transport trolley for mobile operations is also available. Simple and quick installation, also in case of tanks which are already filled. Maintenance is limited to visual check and oil change depending on operating hours.